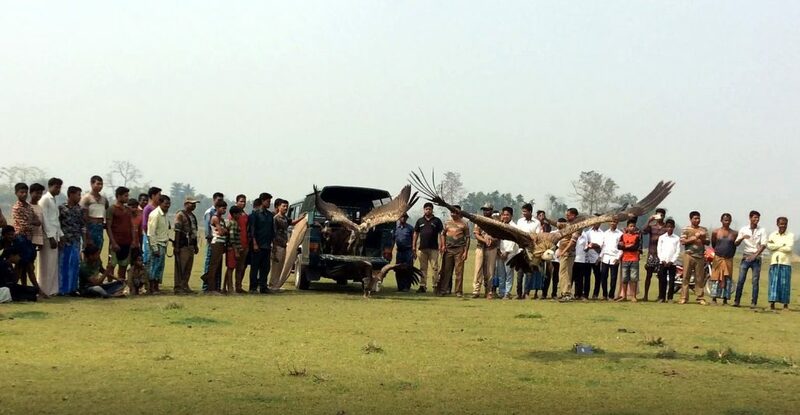 Rescued Himalayan Griffon vultures being released. Ten Himalayan Griffon vultures, which were rescued from being poisoned at Laokhowa Wildlife Sanctuary in Nagaon last month, have been released in their home range by the forest authority of Laokhowa Wildlife Sanctuary along with the team of the Centre for Wildlife Rehabilitation and Conservation (CWRC) of WTI-IFAW on Thursday. It may be mentioned that a total of 14 out of 26 Himalayan Griffon vultures were found dead in Laokhowa Wildlife Sanctuary on March 25, 2018. Out of the rescued 12 Griffon vultures, two 2 died on the way but the rest 10 were saved by the CWRC team of veterinarians, who took utmost care and treatment of the vultures in isolation for 10 days. As all the vultures became fit to be released, the birds were freed in their home range in the sanctuary during a joint awareness meeting with the fringe village people. The vultures became sick due to secondary carcass poisoning by miscreants inside the protected area. Secondary poisoning incidents are growing day by day causing the decline in the vulture population. People intentionally bait carcass to kill dogs and other carnivores but most of the time vultures got affected. As per a media report, the last case of mass poisoning was reported from Goalpara district in western Assam in March 2011. At least 20 vultures died after consuming poisoned carcass of a dog.